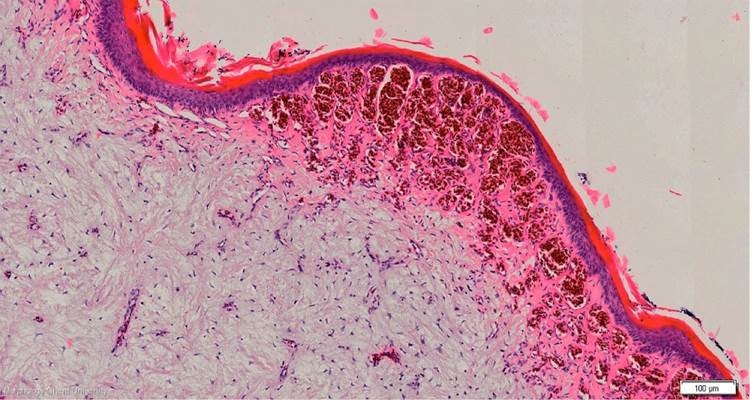 The intermediate layer consists of loose collagenic and elastic connective tissue with large intertissue spaces filled with mucoid and is derived from the stratum compactum of the dermis. The superficial layer of the dermis is packed with sinus capillaries which cause the red color of the comb. The comb of a laying hen, compared to that of a rooster has fewer and smaller capillaries underneath the epithelium. The intermediate layer of the dermis is less mucous but contains more collagen fibers.